Glowing creepers eyes with a guest at an event in Upland, CA. This entry is for the group costume. 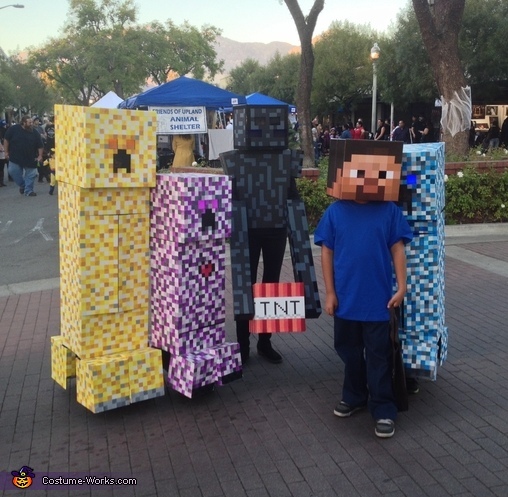 Both my kids and my friends kids wanted to do a minecraft theme for Halloween. So I ended up creating 3 creeper outfits and one enderman. The endermans box was where the candy was place. My friends daughters painted their outfits and I painted my kids. The eyes on the creepers and enderman were glowing and it was so cool late at night to see. My daughter was in the pink/purple creeper with the heart (friendly). My son was in the blue creeper (water). My friends youngest daughter was in the yellow creeper (lightning) and her eldest was the black/grey enderman. Enderman in the game love to steal boxes in the game and the creepers love TNT.